As International Women’s Day drew to close yesterday my thoughts were drawn to an unfortunate encounter I had with a book in the mid-seventies. To read it now, one would think that this book was written centuries ago during the dark ages. For the most part, the 1970s were about social change, the sexual revolution and freedom of expression. However there was one major catastrophic blip that entered my radar. It happened during one of my visits to Virginia. I often travelled there to spend some time with my Mother and her husband Jim. While I was there, we went to visit one of Jim’s IBM coworkers. Our hosts lived in the Shenandoah mountains high atop a ravine in a beautiful wooden house. They were obviously comfortably affluent. The lady of the house was dressed in an appropriately 1970s stylishly long dress and her lovely blonde hair was done up in a bun. She wore an apron and when she was not preparing dinner she was knitting in her rocking chair. Our conversation eventually revolved around to books and what we were reading. She told me that her favorite book was THE TOTAL WOMAN by Marabel Morgan. I told her that I was unfamiliar with this book. It was then that she excused herself and got up from her rocking chair and left the room. A few minutes later she reemerged carrying a paperback in her hands. She handed it to me. “Here,” she said to me. It was the book she had just mentioned. On the cover was the lovely Marabel Morgan with her hair perfectly coiffed wearing a pink dress suit. It was uber 1970’s feminine fashion and of course, Marabel herself was beaming back at me from where she sat on the front cover. As our hostess began to explain the premise of the book, I could feel Mother begin to bristle. She said nothing, but even from across the room I could keenly sense a low growl. Mother’s beaming countenance still had the demeanour of a graceful and happy visiting houseguest. Mother, no doubt had heard of this book before. Upon closer examination, each chapter of this book pertained to how to have a happy marriage. And how do you have a happy marriage? According to the book THE TOTAL WOMAN a wife must be 100% totally submissive to their husband, and have his dinner and martini ready for him when he gets home. Further, a wife must never ask their husband for anything and thus be a nag. Yup, just when you think the dark ages are a think of the past, some yahoo comes along and resurrects backward thinking. 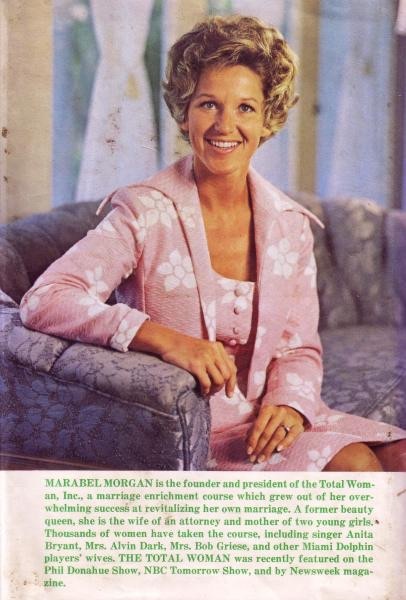 After several appearances on the Phil Donahue show, Marabel Morgan was unceremoniously crowned as queen of the anti-feminists. Perhaps there are some of you who think that such backwards thinking is at long last a thing of the past. One recent movie release, is a clever variation on this very same theme. It promotes male superiority and female submission in no uncertain terms. 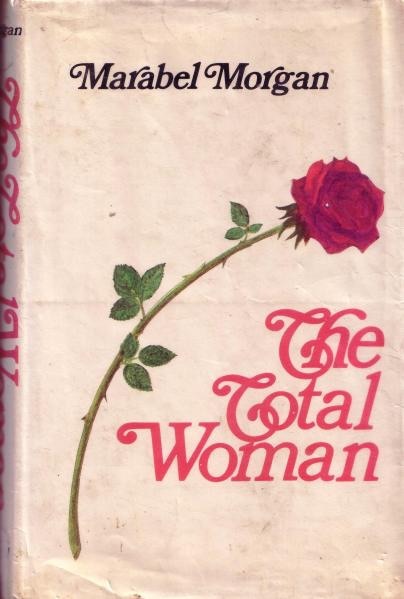 I’m grateful that Mother gave me that warning shot across the bow which immediately made me wary of the backwards thinking that fills Marabel Morgan’s book, THE TOTAL WOMAN. It’s easy to get swept up in what is thought to be popular, trendy and right. Working at the Post Office, I’ve sorted a lot of magazines. I know that I am coming close to my breaking point with all the photoshopping that I’ve seen. Certainly, we have grown too complacent with the false images of perfection that these magazines convey. Further, I feel we may have even grown blind to their negative effects. How much airbrushing is too much? Last month there was a magazine featuring a celebrity and her family. Not a hair out of place with a lovely array of sparkling faces beaming up at you from the cover photo. Even their DOGS are photoshopped. Further, I recently saw a magazine cover of a popular singer with her beautiful new baby girl. I had to do a double take on the baby’s eyes because they were such a deep and unnatural aquamarine blue. If I were to see such eyes in real life I would consider them scary. And I’m talking Damien from ‘The Omen’ scary. This is an image of a made up person. This sets an unobtainable high standard for children, young people and adults who don’t know any better. Years ago, I went to my local Ancaster County Fair which is held annually in the fall. There, of course were the obligatory farm animals, jam contests and vendors selling their wares. At the end of one aisle was a woman selling weight loss supplements. Of course, this woman was very slender and an exemplary candidate which mirrored her sales pitch. However, her young and lithe body did not match her face and neck which was beset by premature wrinkles giving her skin an aged, and extremely leathered look. Now, on the exact opposite end of the very same aisle was a female vendor who was selling skin care products. She had beautiful, radiant and glowing skin. She was so very lovely with her rose leaf complexion. Over the years, I’ve thought about these two women. They gave become a valuable reference tool for me. Life is not like that. Surprisingly enough, this week I saw a copy of a magazine with about half a dozen models on the cover. They all looked very young indeed, however there was something unusual about them. They looked as if they had no make up on. When it comes to European bathroom etiquette and general knowledge, ignorance is not bliss. The more information you have in regards to finding and using the washroom facilities, the less likely you will become scarred by your experiences. A coworker who had travelled to Paris before my first trip to Italy shared her overseas experiences with me. And I’m very glad that she did. I appreciated her insight, and she warned me that they were common throughout Europe especially in older and less developed areas and establishments. Had she not warned me about them, I have no doubt that I would have been reduced to tears if and when I was suddenly confronted by the cold reality that I would be forced to use one. 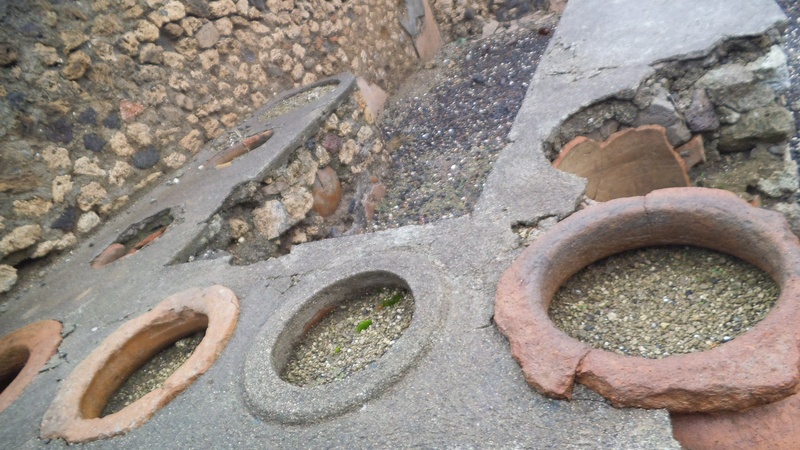 If you are planning a trip to Europe, and/or find yourself curious about these squatter toilets and would like to learn more about them I suggest you google this subject matter as there are a number of sites that go into precise detail and instruction on how to properly use them. As for myself, I do not have the heart or the will to write about them. I’ve touched upon this subject matter at this point only because it was during my first trip to Pompeii that I began my adventures with how shall we say…. … Overcoming challenges when you find yourself in a cultural predicament when nature calls. It was our first trip to Pompeii in September 2008. We had finished our luncheon and I was taking advantage of the outdoor bazaar to pick up some Pompeiian souvenirs before our tour on the Pompeii ruins began. After making some purchases I started scouting the area for a washroom to ensure that I would not get caught short during the tour as I highly doubted the ruins of Pompeii would include a 7-11 or other similar pitt stop. I found a little building which appeared to be the designated ladies room. There was an old woman sitting at the entrance. As I approached the door, she held out her hand to me. She wanted the equivalent of fifty cents before she would allow me to enter the bathroom. There was a small paper sign over her head which gave the name of the charity that was being collected from the public for that day. I did not have the fifty cents. I told her that if she allowed me to use the facilities, I would immediately return with the money. She nodded her head no. Exasperated, I went to look for Frank for the required change. I returned with double the amount required, and handed it all to her. Henceforth, I had no problem as I spirited myself away to make use of the facilities as I left her behind in a proverbial cloud of dust….